Two cases of the deadly disease in dogs, Alabama Rot, have been confirmed in Sussex, according to a veterinary specialist. Just days after vets gathered at a special conference to discuss the on-going research into Alabama Rot, the total number of cases in the UK has now exceeded 100. Four new cases of the deadly dog disease have been confirmed by Anderson Moores Veterinary Specialists, in Greater Manchester (Radcliffe), West Sussex (West Chiltington), East Sussex (North Chailey) and Devon (Cullumpton), taking the total of confirmed cases since 2012, to 102. The first ever Alabama Rot conference was hosted by David Walker and Laura Holm from Anderson Moores Veterinary Specialists. The conference was attended by a variety of leading clinicians, academics, microbiologists, epidemiologists and human medical experts. David said: “We were delighted to welcome scientists from the field of human medicine to the conference, alongside vets from academia and specialist private practice. “The conference was very positive, with everyone contributing greatly to the discussion, and we look forward to continuing to work with our fellow professionals to research this condition. “We’ve already started the process of setting up a steering committee, to help focus the enormous experience and knowledge from the 30 specialists who gave up their time for free to attend. “The committee will be in regular contact to co-ordinate efforts and collate any new information to aid progress in research. “Among the items we discussed was the sharing of data from similar human health issues to identify any possible connections. 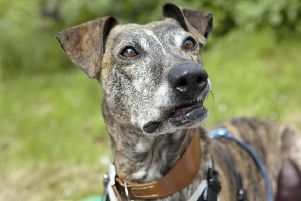 Alabama Rot, which first appeared in the late 1980s affecting greyhounds in America, has now been found in 29 counties across the UK since it was first detected in the UK in 2012. All of the UK cases confirmed with Alabama Rot to date had been breeds other than greyhounds, however, the first UK greyhound with skin lesions and kidney failure – the hallmark features of Alabama Rot – has now sadly been confirmed. The cause of the disease, clinically known as idiopathic cutaneous and renal glomerular vasculopathy (CRGV) is still unknown, but one of the discussion points at the conference was the importance of funding. “Research is vital if we are to understand more about this condition, find a cause and be able to prevent or treat it, and funding is essential to achieve these goals,” added David. “We are working with organisations including Vets4Pets, which has more than 400 practices across the UK, some of the UK veterinary schools and the Alabama Rot Research Fund, to increase the research effort. To help collate accurate data about the disease, Anderson Moores and Vets4Pets are asking all vets in the UK and Ireland to contact them if they see a dog they suspect has Alabama Rot. “We would encourage all vets and owners to work with David and his team at Anderson Moores so we can have a clear picture of confirmed cases in the UK and Ireland, to help prevent more dogs falling victim to this terrible disease,” said Dr Huw Stacey, vet and director of clinical services at Vets4Pets, who also attended the conference. “Treatment is supportive, but is only successful in around 15 to 20 percent of cases, which is why we’re encouraging all dog owners to use the online interactive guide to help them understand the clinical signs and confirmed locations of the condition. “The first sign that is normally seen is a skin sore that isn’t caused by a known injury. Most commonly these sores are found on the lower half of the leg and appear as a distinct swelling, a patch of red skin or are open and ulcer-like. “If a dog some dogs successfully recovering from the condition.